I had the joy of participating in the Lagoon Kickstarter back in March 2014 – and it was a joy, the coments section was lively and friendly, the creator (David Chott of 3 Hares Games) was quick to answer any questions and take suggestions, and we found ways to bond over this game with things like “backer introductions” and polls for the next druid faction token – and it finally, gloriously arrived at my door the other morning! I set about photographing my unboxing immediately, with some help from Bear, the loveable and just a little bit silly feline. My toddler (not pictured) was also “helping” each step of the way, so it’s a rather good thing that the box and contents were of a superb quality. 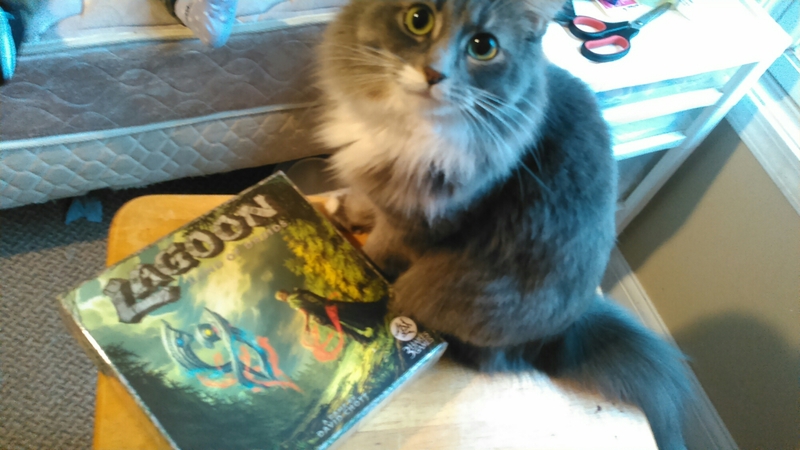 Now, as I have not had the chance to play Lagoon myself (and it does have solo-play rules, something that all too many games are lacking in), this is strictly a product quality review, not a game play review. If you’d like a look at the game play itself check out Joel Eddy’s video review or Daniel DeMars’ written review, the latter of whom had the opportunity to demo Lagoon multiple times at Gen Con.